It looks like the week is going to end on a sour note. 1. 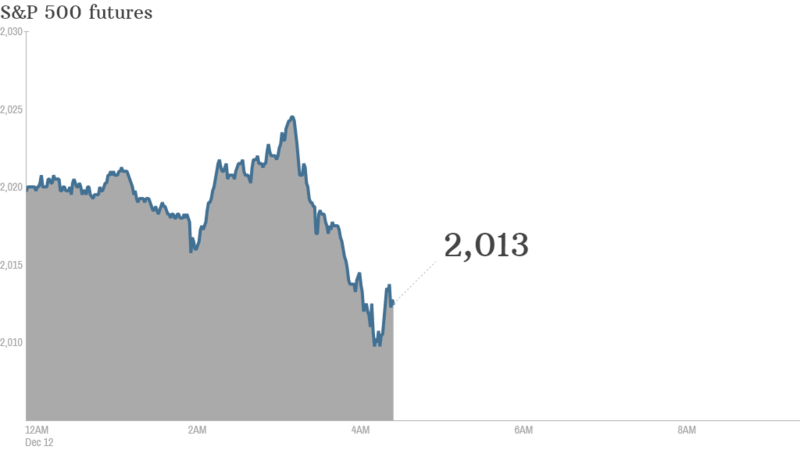 Moving into the red: U.S. stock futures are all heading lower, and the mood is downbeat. Despite a decent rally on Thursday, market performance over the rest of the week has been lackluster. All the main U.S. indexes look set to close the week with losses. The main European markets were down by about 1.5% in midday trading. New data released Friday showed industrial production in the eurozone barely grew in October. 2. Oil slips further: Oil prices are continuing their downward trajectory, with U.S. crude futures dipping below $59 per barrel. The Paris-based International Energy Agency cut its forecast for demand growth in 2015. Oil prices have fallen by more than 40% since June due to a supply glut. 3. Government shutdown averted: Late on Thursday, Congress narrowly averted a government shutdown by approving a $1.1 trillion spending bill that keeps the government open through September. 4. Russian ruble hits a new low: The Russian ruble hit a new record low versus the U.S. dollar Friday despite Thursday's interest rate rise -- the fifth this year. The economy continues to be hit from all sides by falling oil prices, Western sanctions and high inflation. 5. Thursday market recap: All the main U.S. indexes closed out Thursday with gains, but falling oil prices put a dent in the market rebound. The Dow Jones industrial average had rallied by more than 200 points, but quickly fell back to close with a gain of 63 points. The S&P 500 and Nasdaq also both finished with a gain of 0.5%.